Your natal Uranus shows where you're innovative, original, and want to things your own way. The house position is more important than the sign position because Uranus moves slowly, spending many years in one sign. With your natal Uranus in Aries, you can come up with new ideas and paths, but may have a hard time figuring out if it’s a good or bad idea. You have plenty of energy, do things your own way, and won’t be forced to be anything that you’re not. You’re enthusiastic about pursuing new things, and can be impulsive. With your natal Uranus in Taurus, you seem like someone that’s easy to be around, but you actually have a stubborn side to you. The more you stick to your position, the worse it gets for you, so learn to be more flexible. You can make things happen using innovative, original methods. With your natal Uranus in Gemini, you’re an adaptable person, and likely drawn to technology. You have a diverse group of friends, and love to learn, especially about original ideas and unusual subjects. You need a certain amount of change in your life, and aren’t afraid of new ideas. With your natal Uranus in Cancer, you’re dedicated to your home and family, but you may be someone who wants to change conventional family, and the family that you have may not be the family that you share blood with. You can be a sensitive person and it plays with your energy levels. With your natal Uranus in Leo, you have plenty of passion and can use this to help the world on a large scale, or to make a contribution on a smaller scale in your own life. You tend to do things your own way, can speak your mind about subjects you’re passionate about, and can lead people. With your natal Uranus in Virgo, you can be inventive when it comes to dealing with work, becoming more efficient, health issues, and service. You can be attracted to science, or be concerned about the environment. You have a great mind, and you can use this to succeed. With your natal Uranus in Libra, you’re usually a creative person with some sort of artistic talent. You care about equality, and will fight for those who can’t fight for themselves. Relationships likely need to be unusual in some way in order to be successful. With your natal Uranus in Scorpio, you have a determined personality and usually do things differently when solving problems. You can be a passionate person, but it can get you into trouble. You can find new ways of digging into mysteries, which can make you good at research, psychology, and science. With your natal Uranus in Sagittarius, you’re an intuitive person and drawn to alternative beliefs. You want to help people, but you may not be reliable. You can be brutally honest at times, and don’t care if it gets you in trouble. You want to push through boundaries, are unconventional, and independent. With your natal Uranus in Capricorn, you can be innovative in business. You come up with new ideas that bring you success. You can face any challenge, prefer convention, and are responsible. You can make changes on the fly as long as you belief it’ll help you attain your goals. With your natal Uranus in Aquarius, you’re an original thinker, a humanitarian, and dedicated to your friends and causes. You can be all over the place, and embrace rebellion. You have a sharp mind, and are future-centric, always looking ahead to see what’s coming. With your natal Uranus in Pisces, you’re imaginative, attracted to fantasy, and embrace innovative spiritual ideas. Your intuition can be heightened, you can be a healer, and your sensitivity requires you to guard yourself somewhat. You need to avoid escapism, and embrace helping others. With your natal Uranus in your 6th house, you can get bored with everyday work, and need work that is unusual in some way. You need an unconventional work environment, and may do better working either on your own, or within a group where you have plenty of space to do your own thing. A normal job wouldn’t be for you. Since the 6th house rules work, planets here can show work you may do, so with Uranus here, you could work with technology, science, innovation, original ideas, in a group, or with friends. The 6th house also rules health, so you can take unconventional approaches to health matters, and are open to experimental ideas. 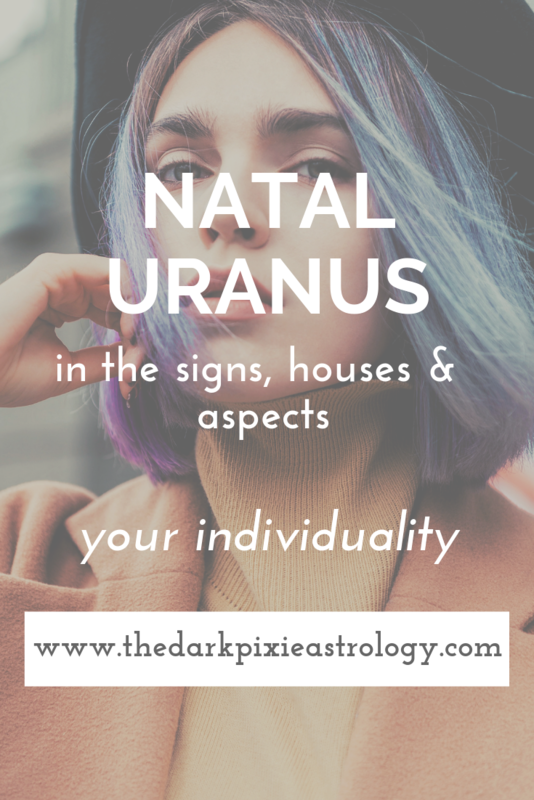 With your natal Uranus in your 9th house, your beliefs tend to be unconventional. You’re attracted to ideas that are unusual, innovative, and out there. You likely love to travel, especially to places that are cutting-edge, and encountering people with highly unusual backgrounds and stories to tell. You’re usually not open to people who hold traditional views and aren’t willing to go against social norms. You can enjoy learning, but it comes and goes in spurts, and you’ll have periods where you’re enthusiastic and dedicated, and periods where you don’t want to deal with it. You want to be as free as possible, hating fences and chains. With your natal Uranus in your 10th house, you do things your own way, and may not be a fan of being tied down to your career. You need a career that gives you plenty of freedom to do what you want, to explore your ideas, and to express yourself creatively. You don’t care about where you fit in society, and aren’t concerned with social climbing. Your elders may be unusual in some way, and you can make an unusual mentor/parent. Since the 10th house rules your career, planets here can show careers your go into, so with Uranus here, you could have a career in technology, science, innovation, using original ideas, working in a group, or with friends. With your natal Uranus in your 12th house, you need to help other people in some way, and you may go about it in an unusual way. It could be a calling for you, and you contribute in a big way, though you don’t need credit for it. You’re likely a creative or artistic person, and like to be around people who are the same way. You can take an unconventional approach to spirituality, and have unusual spiritual beliefs. You may be interested in the metaphysical and study subjects like astrology, tarot, and numerology. You want to explore beyond the world that you see with your eyes, blowing past the barriers that separate the physical world and the beyond. With your natal Moon conjunct natal Uranus, you’re an independent person and need to live an unconventional life in some way. Your emotions can sway from one direction to the other quickly, and you can seem erratic at times. You don’t want to feel as though you’re being suffocated, especially at home, and need variety. You may have a hard time becoming close to people emotionally because you don’t want to become dependent on anyone. With your natal Moon sextile or trine natal Uranus, you’re open to people and other ways of living, and try to keep a nonjudgmental attitude. Everyone is seen as your equal. You’d prefer not to take life too seriously, and can’t stand people who do. You’re up for exploring and want to make life exciting. With your natal Moon square or opposite natal Uranus, you’re torn between dependence and independence. You know you need people in your life to love, support, and nurture you, but you also need space and room to do your own thing without anyone to answer to. This internal war can make you too independent or too dependent, or sway between the two. There’s always constant change in your life, adding to this. You need to find a balance between your need for others and your need for personal space, and accept that you need a certain degree of change in your life. With your natal Venus conjunct natal Uranus, you want love to be different in some way. Some of you may never want to get married, especially if it’s pushed by your family. You could work well in a long-distance relationship. It can be difficult for you to commit to anyone. You like being friends first. You need a certain degree of independence, want to be original, and try to convince people to believe the same things that you do. With your natal Venus sextile or trine natal Uranus, you can deal with all sorts of people from all sorts of backgrounds. You value honesty and know when someone isn’t being entirely truthful. You like experimentation in the bedroom, and want a partner who is open. You don’t feel the need to put a label on your relationships, and can avoid commitment at times. With your natal Venus square or opposite your natal Uranus, you get bored quickly and easily in your relationships. You prefer not being around your partner all of the time, needing a little (or a lot of) space to appreciate them. If they’re around too much, you feel like you’re suffocating. You can start or end a relationship quickly, and can handle a long-distance relationship easily. You can be drawn to things that are considered sexually unconventional. With your natal Mars conjunct your natal Uranus, when you want something, you won’t wait to get it. Everything has the happen right here, right now. You’re impulsive and independent, an interesting, original personality, and highly impatient, which can lead to trouble. If you don’t have enough freedom, you rebel. You’re honest with a lot of energy. With your natal Mars sextile or trine your natal Uranus, you’re an individual and enthusiastic about life. You can be a creative person and require a good amount of freedom. You crave excitement and are always looking towards the future. With your natal Mars square or opposite your natal Uranus, your energy is high, and can surge at the worst moments. You always have something to do, somewhere to go, and can’t sit still for two seconds. You’re your own person and won’t do anything anyone else wants you to. You like to do things your own way. With your natal Jupiter conjunct your natal Uranus, you may always feel like you have to do something new and break free right now. You hate being restricted and want to be as free as you can. You can deal with big projects easily, having a good ability to see the bigger picture. You could have good things happen for you unexpectedly. With your natal Jupiter sextile or trine your natal Uranus, you’re an open person and want to learn about different things. You may be interested in the metaphysical and spirituality, and want to explore ideas that are unconventional. You can use your mind to help you get far, along with your creativity. With your natal Jupiter square or opposite your natal Uranus, you require a great deal of independence, and can throw yourself into pursuits without much thinking. It can be hard for you to moderate yourself, and are prone to excess. You need to take a more practical approach to your goals if you ever really want to achieve them. With your natal Uranus conjunct your natal Pluto, you want to implement social change, but you won’t settle for anything small. You want it to be big, transformative, powerful, and you won’t wait to do it. With your natal Uranus sextile or trine your natal Pluto, you can make social change in a way that’s different, changing people’s mind about causes, and bringing the world forward. With your natal Uranus square or opposite your natal Pluto, you want change, but you can do so in erratic ways that are too out there, or rush into it without any thought. You have to learn to implement change more slowly and to plan ahead. With the transit Moon conjunct your natal Uranus, you could do something completely unexpected, or something could happen to you to throw you. New things just happen out of the blue, and you’re more spontaneous. You want to break out of the box, and resist any rules or constraints anyone may try to put on you. It’s important to remain open with this transit, because anything can happen. With the transit Moon sextile or trine your natal Uranus, you don’t want to deal with your daily schedule; you want to do something different and new. You could get unexpected positive information, and you can take more risks. You want to stand out and be an individual, even if only for the few hours this transit is felt. With the transit Moon square or opposite your natal Uranus, you could encounter unexpected changes that you’re not happy with. If you can try to see the change as positive in some way, then it may not cause as much trouble as if you threw a fit. Other people may seem unreliable to you, or you to them. You may resist something simply for the sake of being rebellious. You could desire change but be unable to do anything about it, making you irritable and feeling trapped. You can also have technological problems. When transit Mercury is conjunct your natal Uranus, you can come up with the perfect solution or idea out of the blue. Unexpected news could come that’s good to hear. You may decide to try an unconventional approach to a project. You can be scattered and all over the place if you don’t direct the energy well. When transit Mercury is sextile or trine your natal Uranus, you have an easier time dealing with groups of people and communicating with others. You should try to listen to your gut. You’re more open to new ideas, concepts, and thoughts. When transit Mercury is square or opposite your natal Uranus, you may be too out of touch with your ideas. You can have a hard time coming up with ideas, and feel scattered. You may not finish things, are easily distracted, and feel misunderstood. You can have a fight with someone because you don’t understand each other. Something could happen unexpectedly that throws you, or you do something unexpectedly that you regret later. With transit Venus conjunct your natal Uranus, you find pleasure in things that are quite different from what you usually go for. You may be attracted to someone or something unusual, or try something different in a relationship. You need excitement, change, and variety. You can have an unexpected financial dealing. With transit Venus sextile or trine your natal Venus, you’re good in social situations where you have to do things differently. You’re open to people of all walks of life, love things that seem extraordinary, and want to try something new. You feel creative. With transit Venus square or opposite your natal Uranus, you can buy impulsively and regret it later. You can be suddenly attracted to someone or something that you don’t care for later. You can feel bored, restless, or frustrated in your relationships. You can have something come up unexpectedly in a relationship that throws you off.